I finally moved back to Van and my blank white walls were taunting me. It's hard enough having bedding you don't like but blank walls too? It's too much. I went on an impulse and printed lots of photos in my local Staples store (which is cheaper than other photo places if you want 5 x 7 only!) and this is the result so far. I have a lot of Instagram photos waiting to be printed so expect Phase 2 to follow soon! First up was the addition of these beautiful calendar pages from Clemence at Oh The Lovely Things. She has collaborated with a few others to create this gorgeous Calendar which is free to download on her blog. I just popped into my local staples and printed each page as a 5 x 7 which is the perfect size. I just put them on the wall using some craft string and mini clothes pegs which cost less than $4. All in all, this was a lovely and (relatively) cheap way to add some colour to a blank wall. What are your favourite ways to decorate a room for next to nothing? Let me know! Thank you so much! It was a cheeky pinterest find but I am now obsessed with her blog - there are so many fab DIYs! The Pinterest quotes are lovely, I didn't know you could print things at Staples - will have to head there with my long list of photos I want to print! It's so gorgeous isn't it? I saw it and knew it needed to get printed out ASAP! I'm waiting a few weeks to print to some more bits and pieces so watch this space! You've made a plain room look so cosy- those calendar printouts are a great idea! There are so many fab bits and pieces to print out/use on the internet. If I had a printer I would have no ink left! This looks really cute; I love the wall calendar especially, it's such a good idea! 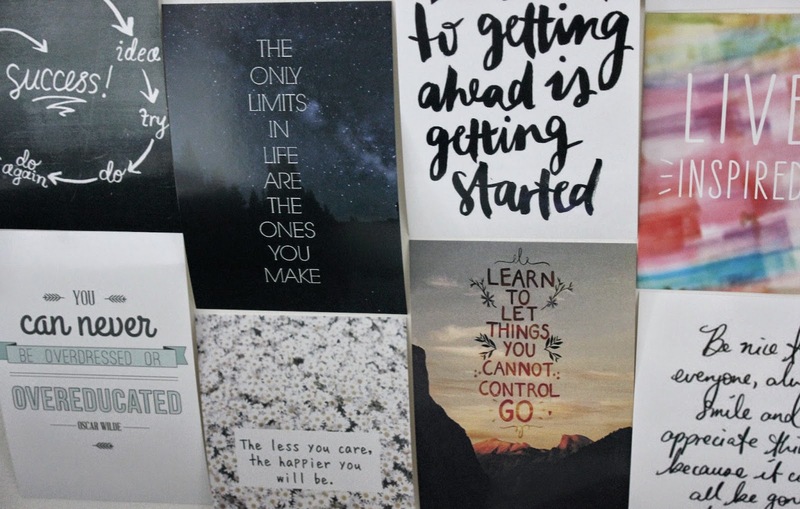 I have a similar thing to your quote wall using postcards from Paperchase, but I hadn't actually considered printing any of my own to go with them until now! I got a few from Paperchase too nestled into the wall. That is really what started it - now I'm spending a fortune on printing out other bits and pieces! Thanks lovely! I love them too and I'm so glad I finally bought some! Thank you! It's definitely my favourite bit of my room now! I love the new look, that calendar is really cute! That sounds lovely! I really want to add more bits and pieces now! Thanks lovely! I'd love to do more to my room (but nothing can be permanent unfortunately!) I think the most fun bit of decorating a room is all the research! Thank you so much! 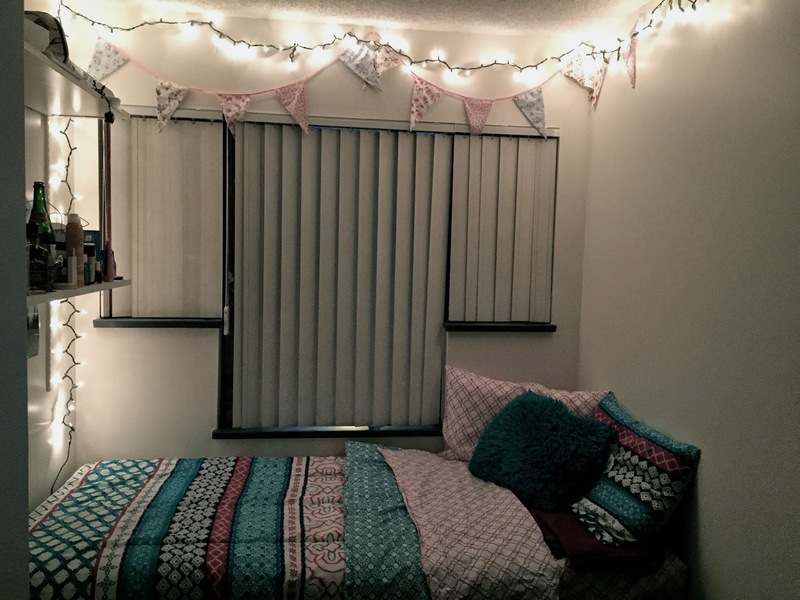 I have had my bunting in every university room - it's just so adorable! You've made your room look so nice and pretty!! Im really jealous. My walls are painted this horrible yellow cream colour which is just gross. I've got stuff all over my room as well so don't see much point in decorating. When I'm back living at home I'm going to start making my room nicer and more 'adult' I think. Love the calendar idea though, super pintresty! I love the positive thoughts board! Totally going to give that a go! I found your blog cause you commented on mine! (www.allyinblunderland.co.uk) - Thanks so much for stopping by! I love these kinds of posts, and the calender idea is so cute! I'm also loving the idea of a positive thought wall.. SUCH a good idea! My room is currently in the middle of a makeover (as it has been for the last few years.. I seriously just can't find the time!) But when I've got round to re-painting my walls, I'm totally going to be stealing some of these ideas!